« Something different – for the “Music” section ..
No objections here … looks cool as it is (just add some MKP bypass foil cap on adjacent to those output tube floating power supplies). Why the red “Panic” button ? 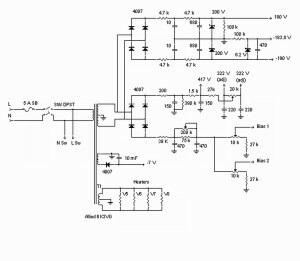 Because it is soooo obvious for me that the fuse must be there, that I did not notice that it is not drawn on the schematic. If one of the tubes fail, your speaker shall be exposed to 145 Volts DC. That is not a problem, as long as the FUSE is the first to blow, and not the coil of your woofer in your speaker. From practical experience I KNOW that the 3,5 Amperes fuse provides a reasonable compromise between music transient output power, big bass …. 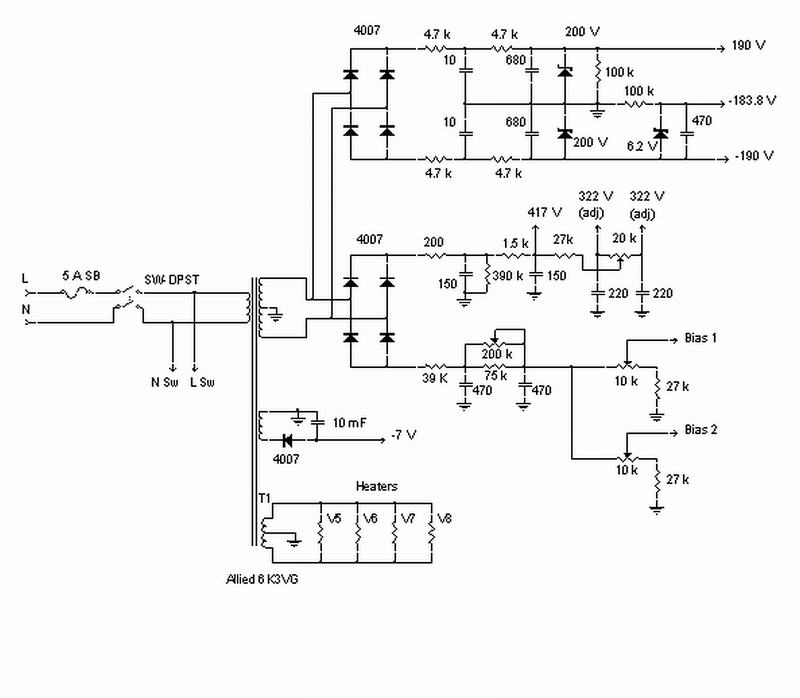 as opposed to 145V DC …. But driving the speaker WITHOUT this fuse is pure insanity. 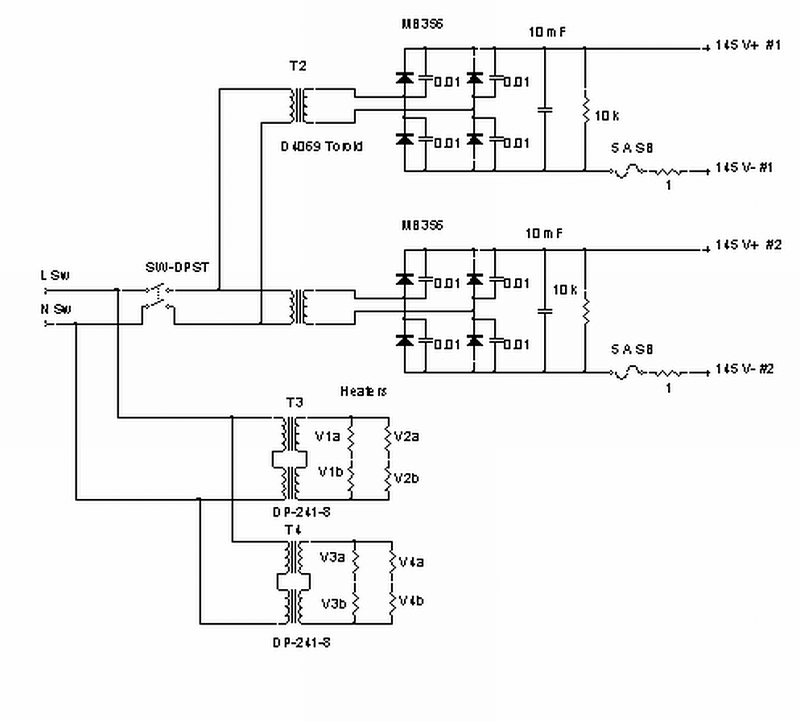 Now, this pre-amplifier stage looks fine … sort of. The only thing that I would reconsider is that LM317 integrated voltage regulator, used with the output-to-adjust serial resistor, so as to convert it into a current drain. 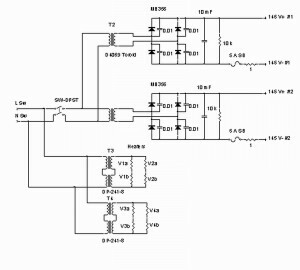 I read about some of the specifics of this chip in the context of noise and stuff, so using this topology as a drain in the very very input stage is a rather brave undertaking. 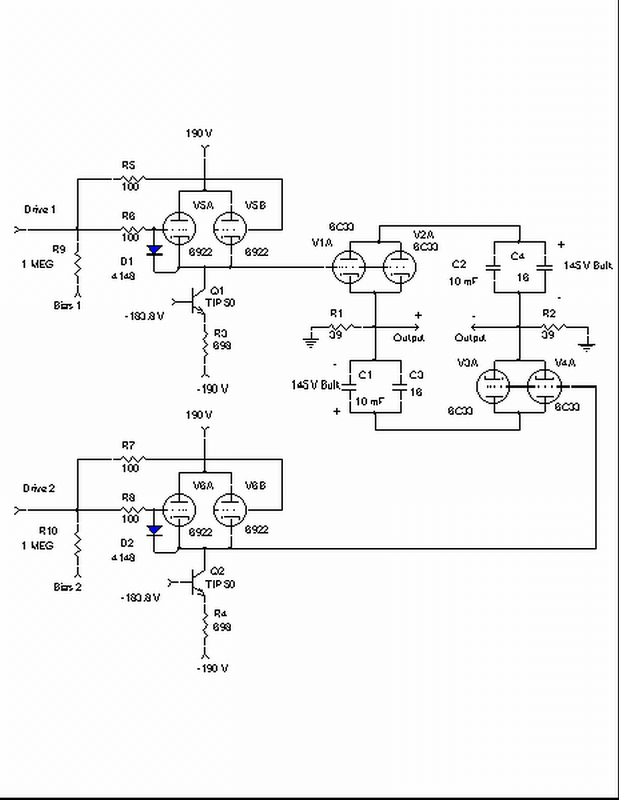 How about building a simple current source out of two cascaded n-p-n transistors here ? If you do not want to fiddle with the transistors, then at least maybe consider some ultra low noise, low voltage regulator from LT (Linear Technology) for this purpose ? … Or maybe, just maybe, go a step further and build a very nice current drain, based on any popular pentode, with rather flat anode characteristics ? For starters, maybe an EF86 or the 6AC7 or something ? I would not be myself if i were to implement the diagram above “as is”. 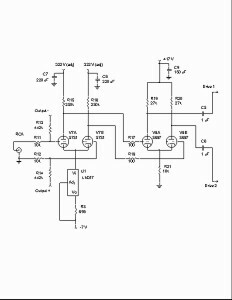 I would generally introduce at least a two stage filter for the output tubes, with some home-made choke of say 1H and of a DC resistance of not more than 0,2 Ohms. Just for the fun of it. As for the filament supply of the output tubes, it would obviously remain AC heated, as a result of the sheer amount of Amperes flowing in that circuit. A DC type of approach here would be on the boarders of sanity. 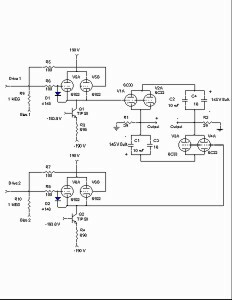 Here I would probably strap the Bias_1 and Bias_2 pots, with an additional 100K resistor, connecting the middle wiper with the negative voltage side of the pot, just to be sure, that in case that the wiper fails into a no contact condition, my output tubes will get a fair share of negative bias via this security resistor and to not fall into a high current situation. I would also seriously consider implementing DC filament heating for the pre-amplifier stage tubes. Some extra electrolytics within the filter stages, bypassed with some smaller MKP foil capacitors, would probably not hurt either. 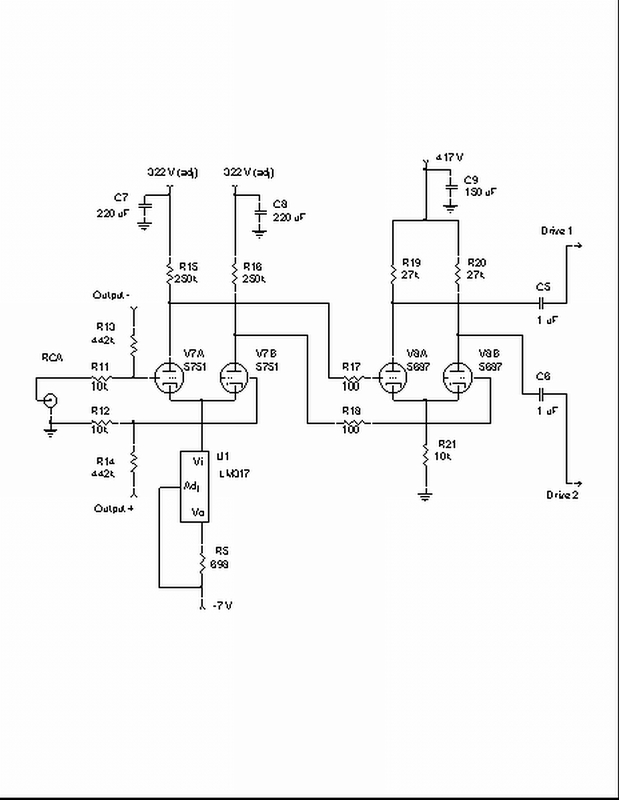 As for the rectifier diodes, the “4007″ …. here an obligatory diode bypass cap for each of the diodes is necessary, something of say 22nF and 1000V. This will get rid of those nasty switching spikes that are typical for such diodes. On the other hand, it would not hurt to use some other type of diodes, ones that are less noisy from the outset. This is a GREAT, zero-feedback, design.